and computer furniture. In some instances, a pre-existing eye problem may be the cause. Why Do We Get Eyestrain? cases, these symptoms will not start immediately, but only after several hours of work. When the muscle in the eye becomes fatigued, the eyes may feel uncomfortable or ache. The vision may blur off and on. A mild headache can occur if the eyes continue to work. unfocus, leading to blurred distance vision. a set distance continuously can fatigue the lens. and leads to more rapid fatigue. Working in situations with inadequate lighting, or with glare from overhead lighting. Having other underlying eye problems, such as ocular allergy or dry eye. fixated on a near object. What Can We Do About Eyestrain? can take measures to reduce eye discomfort. ocular conditions that may exist that are causing eye symptoms. may be even more necessary. be discussed with the optician. figures may be obtained in the documentation that came with the computer products. that the characters on the monitor and the background so the letters are easily read. seconds. Every twenty minutes, get up, stretch your back and neck and look around. Move your eyes and move your body, change your position. experience dry eye symptoms of burning, sand-in-the-eye, heavy lids, etc. symptoms. You stop work, fall asleep and your body heals itself until the next time. 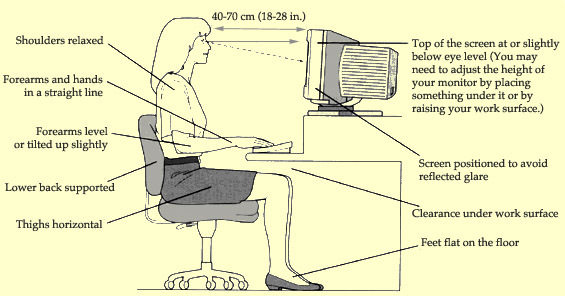 It won't affect your health if you're in the proper posture. When you over-exert the eyes over an extended period of time staring at the computer, you'll experience eye strain. To reduce the effect of eyestrain, position your monitor below eye-level. That way your eyes won't have to be as open in order for you to see. Great article, I feel the strain in my eyes after I work everyday.